Authors: A. Rettura, et al. Astronomy often proceeds by the study of statistical distributions of various parameters over large samples of objects. This is the principle behind the H-R diagram, which was an invaluable tool for learning about the evolution of stars. Sample distributions have also been useful in recent attempts to find a unified model of active galactic nuclei. If particular properties of a sample such as mass and luminosity deviate from a purely random relationship, then we can infer that some physical principle(s) must be responsible for establishing a preferred relation; for example, the different regimes represented in the H-R diagram such as the main sequence stars, brown dwarfs and red giants all reflect different underlying nuclear processes that power a given star’s luminosity. The same applies to the study of galaxies as a whole. Galaxies can be characterized by their mass, morphology (shape), overall color, age and other parameters. Since we cannot simply measure astronomical objects by placing them on our bathroom scales, we must instead come up with inventive ways to infer things such as a galaxy’s mass, just by looking. As one might imagine there are many established techniques that are suited to many different types of observations and scenarios, and characterizing the relative inaccuracy and applicability of each method is critical for progress in our understanding of galaxy evolution. This paper is an example of comparing two different techniques for measuring galactic masses for a sample of galaxies around redshift 1. 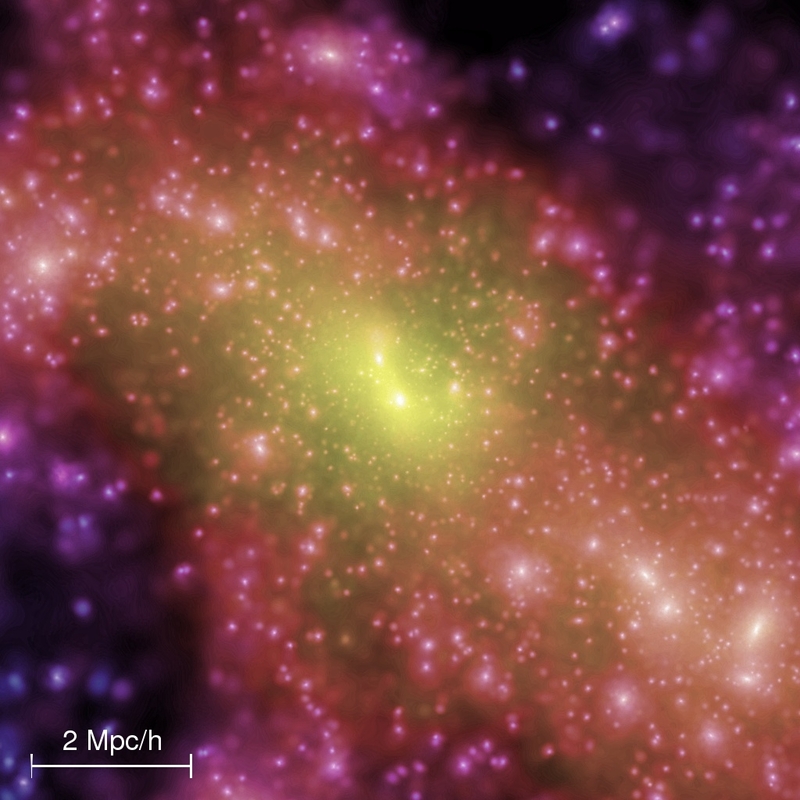 In the past, studies of galactic mass / luminosity ratios have provided increasing evidence that a galaxy’s evolution is critically affected by its mass, and this is an important area of continuing research. However, most such studies today rely upon the method of fitting observed spectral energy distributions to simulated models in order to infer galactic properties. Naturally, we might ask how well this technique matches up to other methods, such as inferring a galaxy’s mass through the motion of its constituent stars or through gravitational lensing observations. A spectral energy distribution (SED) for a galaxy is simply a plot of its total luminosity versus frequency of radiation. We can approximate to measuring an SED by taking multiple photometric measurements in different wavelengths. Magnitudes at different wavelengths broadly measure different underlying physical processes- for instance, a galaxy’s (rest frame) near-infrared magnitude closely traces its mass, ultraviolet magnitudes can be used to infer star formation rates, x-rays can indicate active galactic nuclei, binary populations, and hot diffuse gas; when you put data from all these different passbands together, you can start to build up a unique picture of a particular galaxy. Its composition and history are in some way reflected by its detailed spectral profile. We can also model what sort of SED we would expect to see for a galaxy of a particular mass, age and evolution, by setting up a simulation of a stellar population and allowing it to churn through billions of years of star formation, evolution, death and feedback and then checking its final radiation profile. As you might imagine, these models are sensitive to one’s initial assumptions and a host of models have been developed and tested over the years. 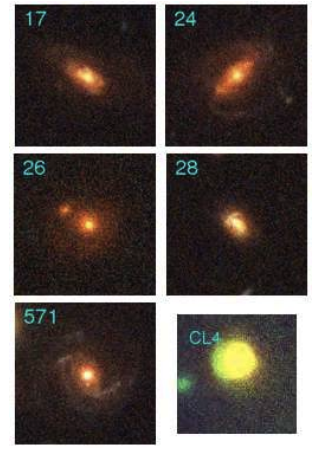 In this paper, the authors first select their sample of galaxies near redshift 1, obtain data ranging from visual to infrared, and construct SEDs for their sample. The details of this photometry are pretty interesting as it requires the integration of data from many different sources representing different telescope designs and resolutions- instruments on the Hubble Space Telescope, the Very Large Telescope, and Spitzer provided the data. Care must be taken to process and match the data so that it can actually be treated as one set and meaningful comparisons can be made. The authors then establish galactic masses by comparing to a variety of different SED models- results from PEGASE.2, M05, and BC03 stellar population models are compared to determine how sensitive the mass estimate is to one’s choice of model. These are then compared to mass estimates derived from dynamical observations- that is, the kinematics of the stars within the galaxies. 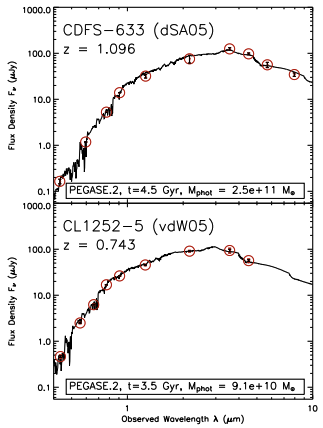 In the end, they find that PEGASE.2, M05 and BC03 models do not significantly disagree in mass estimate. What’s more, these estimates reproduce the results from dynamical observations with an average offset of ~80%. Ultimately, the authors conclude that SED methods are robust in the regime of the massive early-type galaxies that they studied, although over larger ranges in mass the relationship between photometrically-determined and dynamically-determined masses is unclear. Several other interesting topics are covered in the paper, such as using rest frame near-IR magnitudes to estimate mass, and using SED models to establish morphology. The authors also describe in detail the various systematic effects that make a direct photometric versus dynamical mass comparison difficult- things such as dark mass concentration, dust extinction, and galaxy interaction can all affect the results of various mass estimates. I'm a second year astrophysics graduate student at the University of California, Riverside. I work with Gillian Wilson studying galaxy clusters and galaxy evolution.